No politician in India has been tainted in such a unabated manner and no one has withstood it with much pliability and audacity as him. Started with unfortunate 2002 Godhra incident where the Charges against Narendra Modi were baseless and entire false propaganda was planted to defame the then Chief Minister and incumbent Prime Minister Narendra Modi.The opponents aimed at converting falsehood into belief among the general population and influential intellectuals. As the old saying stands "Truth alone triumphs,not falsehood".Today, the lid over the entire planned conspiracy has blown, and IPS Sanjiv Bhatt and Teesta have been exposed. His dark patch started with the unfortunate 2002 incident which was a well planned conspiracy by the centre to create fear among the Muslims against the gladiator which is still evident. The unfortunate planned riots were followed by the state elections the results of which made the psephologists run for cover. Narendra Modi’s name is already etched in the books of Gujarat history, and will always be remembered for his glorious developmental vision and execution. Plaudits to him!! A common man has risen from amongst us in form of Narendra Modi, the reformer in chief. Modi's journey from a tea seller to the Prime Minister has been one of struggle, dedication, determination, hard work and perseverance. An average Indian finds his own reflection in the struggle of Modi. All my life I have heard the uber famous line "Iss desh ka kuch nahi ho sakta" and after all I have seen one man just like you and me who is a hope for 1.2 billion Indian’s. He has laid out an ambitious vision to reduce corruption, poverty, improve education, empower women and girls and unleash India's true potential with "Ache Din" ahead. Modi believes that inept governance is responsible for all the perils in the society and the solution to all the perils is ‘Development’. He is unusual, he has garnered support cutting across the traditional vote banks politics. He may be criticised by his opponents but one must remember no stones are thrown on a fruitless tree. India needs Narendra Modi more than Modi needing Delhi. He is a hope, he is an aspiration, he has committed himself, he has strong convictions, he is resilient, and he has the right intent. If anybody can transform the society we live in, Modi can!. A well deserved recognition by the U.S President. As the saying goes great men think alike and this is what Mr Obama's comment on Modi indicates. Modi and Obama think alike and welfare of people anywhere dominates their thoughts. The Bharatiya Janata Party won the 16th general election by tapping the aspirations of India, the mandate signifies the aspirations of the common mass. After winning a majority on its own, the BJP, in its first policy statement -the Union budget, initiated a step to reboot the Indian economy in order to attain “acchhe din”(good days). Well, the reformer in chief is aware of the high expectations of 1.25 cr. Indians. 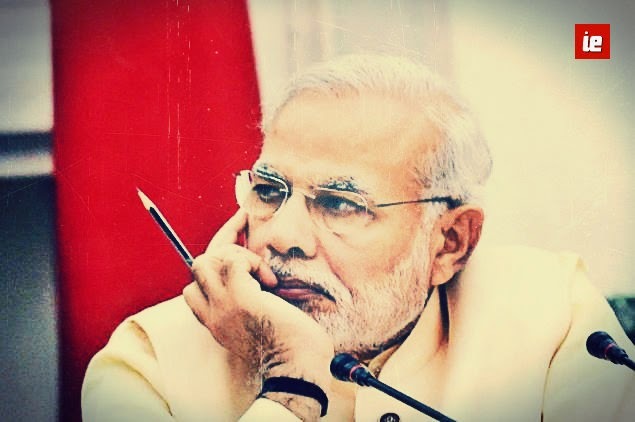 Modi has won muslim heart by presenting them the real meaning of Hindutva earlier the opponent criticised Modi in the name of Hindutva and illiterate and semi-literate voters were grabbed in the vicious circle of rumours. It is melancholy that in our country we connect every roots with roots of religion without having knowledge of religion and its true identity. Narendra Modi’s USP is his integrity and nobility. The incumbent Prime Minister is known for his penchant for hard work.. A lover of traditional music and a devotee of Lord Mahadev, he will face the biggest challenge of re-modifying India with his unshakable USP. Narendra Modi has lived up to his name, Nar + endra = Leader of Men (Sanskrit). The lion eats last, the man who laughs last laughs best. Opposition’s, media, anarchists, have had their hyena time. Now its the lion's turn. The Modi’s good governance process seems to be running in momentum. 100 days is not enough to judge a government but it’s enough time to understand and predict its future. The Chief reformer and his team looks sanguine to consummate those hopes and aspirations. In the hindmost 100 days the control and administration has moved from an epoch of policy immobility to an epoch of policy primacy. The Narendra Modi’s ambitious projects such as Jan Dhan Yojana, Beti Padhao : Beti Bachao, Swachh Bharat Abhiyaan, Smart Cities, Disbanding planning commission, weeding out archaic law are utterly a stride towards cognizance of the Modi’s India-the India 1.25 cr reckon upon. The Modi’s foreign stratagem appears geared to reinvent India as a more merciless, reliant and taut nation. No suspicion he has shove India as the “biggest opportunity” for both business investment and career-building in the current global economy. Plaudits to him and his zeal. He has consummate astounding blooming and economic growth and at the same juncture invigorated societal inclusiveness. Even as the relentless and pervasive hate campaign against him has continued unabated in the past he has toiled hard to regain the confidence of the minorities. Indian faction is now admired all around the sphere and time has changed promptly. Now the World is seeing India with immense craving and buoyancy. The rings of change are swift moving! From expeditious resolution moulding to tactile exertion on the deck level, from ameliorated output to India's stature on the world stage increasing. India is truly undergoing phenomenal metamorphosis! Narendra Modi’s startling triumph gives India its peerless odds ever of opulence. Plaudits to him and his zeal.